It was the last time that I went to Folk Alliance, this singer songwriter convention. It was in San Diego that year, February of 2004, that I first ran into Chandler Travis. Several floors of a moderately good hotel are rented out by the convention, and myriad rooms are hosting "showcases" where a singer songwriter or small combo can be seen, heard, and hired by a prospective agent from another state or country. So, I was hurrying between two rooms, either to play or see someone play, and passed a room where a good jam was happening, and it looked like people were standing around in pajamas and top hats. "Hmm... have to go back there." And sure enough, a friend walked me back there later. This eclectic bunch called The Chandler Travis Philharmonic were playing some of their own way out great songs, and were backing up others playing theirs. Then a friend suggested to them that they get me up for a song, so I played one called "If Love Turns Its Back On You." They subsequently began a feature on their website called "Love To Turn You On" which features tales and mp3's of different grooves or songs they have unearthed. Our fortuitous meeting in this song was the first clip that went up on this page. I heard some great songs that night, and made some friendships that persist to this writing. 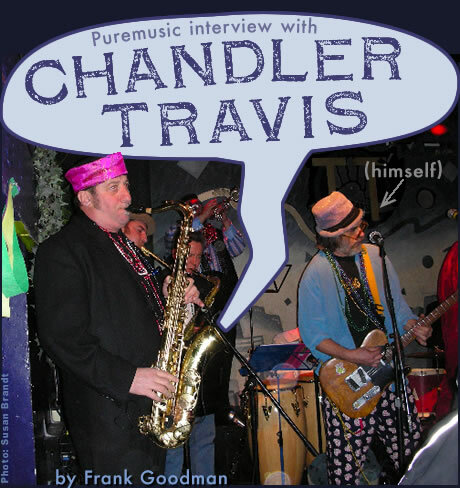 I had the great fortune of being in NYC recently and a scan of the Village Voice listings revealed that indeed the Chandler Travis Philharmonic was in town and would be playing at The Rodeo Bar that night. Although our first meeting was memorable and the CDs compelling, live is where and how this unique and masterful ensemble needs to be seen! In between outrageous songs, Chandler will shed yet another pair of pj bottoms; I think I saw at least half a dozen. And all the players get to play and Do play terribly well. One of the best shows in recent memory. So get this latest record, Kitty, but get clued into their website and side projects, and know when the Chandler Travis Philharmonic is coming to town, because that is something you don't want to miss, ever.